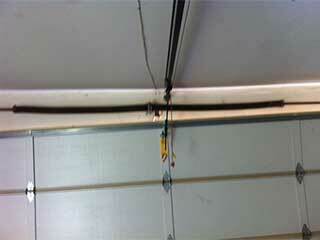 The springs are perhaps the most important parts of your garage door system. These components are in charge of counterbalancing the weight of your door and helping it move, which is why when one of them breaks using the door becomes dangerous and potentially even impossible. Our technicians always carry replacement torsion and extension springs with them, so that they can quickly replace a broken set without any delays. We understand how important it is to get your door working again quickly, so our technicians will work hard to safely disconnect and replace the broken component that's preventing you from using your door. We strongly recommend that you avoid trying to handle these components by yourself; they are under a lot of tension, and this can be very dangerous. If your garage door uses the aforementioned type of springs, then both will need to be replaced when one of them breaks. The reason for this is that since they were installed at the same time, they would have gone through the same amount of wear and tear, and therefore the second one will be nearing the end of its lifespan. When a spring breaks, the tremendous amount of tension that it stores in its coils gets violently released, which can seriously injure any person standing nearby while that happens. To avoid this, both components need to be replaced at the same time. In the previous paragraph, we discussed the extension based type. The second kind are torsions springs. They are by far the more durable and flexible option, and also the safer one, as due to the way they work (twisting and unwinding in order to generate torque) they are far less likely to whip around when they break. The primary cause of a spring breaking is wear and tear; the constant strain of daily use inevitably leads to weakening of these components. Our technicians can extend the life of these components by providing you with a regular maintenance service, during which will inspect their condition, lubricate them and adjust their tension to keep their performance as efficient as possible. Whether broken spring replacement is what you need or you’re looking for some professional maintenance, our team at Garage Door Repair Delray Beach can help. Contact us today to find out what we can do for you.